You’ve been called the Rafa Nadal of table tennis. But even you need to practice. At work, let’s say. So let us introduce you to the Table Tennis Trainer, a portable practice pong setup to bring to the office and keep your game at Forrest Gump-ish levels, now available. What you have here is basically the pint-size version of the auto-serve machines you use while working on your tennis backhand, only in table-tennis size (and far easier to shove in a backpack). So the next time you find yourself gearing up for a match against some stiff competition (a Chinese Olympic competitor, a Russian gambler at the bar, your Uncle Steve), slip into an empty conference room at work and set this guy up on the table. 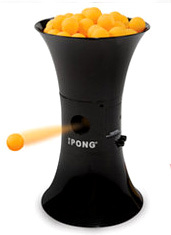 Using whatever spin you want to work on returning—underspin, topspin, heavy topspin (your specialty)—you’ll go ping for pong as it fires out 110 balls per load. And since it can deliver up to 70 balls per minute, you can go through one full load in the time it takes you to replace the toner cartridge in the printer. Or rather, the time it takes your intern to do that.